A couple of weeks before I painted this I prayed and asked Papa what He wanted me to release. In my quiet time, He took me to a valley. It was lush and green, safe... I felt like I could just stay there and rest. But then He showed me a mountain, over His left shoulder. He said, they are both beautiful. The mountain is hard to climb, but the the view is AMAZING!! It was as though He was inviting me to take the mountain. I felt led to start learning about mountain climbing, researching it, just seeking what He was trying to say to me. The next time I went to be with Him, He put a backpack on me and sent me up the mountain. It was hard work to climb...but when I reached the top, He was right, it was worth it. The view was amazing!!!! There were mountain peaks all around. I opened my backpack and inside it were art supplies and an easel. I set it up and waited on Him...asking if "this view" was what He wanted me to paint. Then I saw it. An eagle's face. It startled me, I jumped... This eagle was so determined, fierce and on a mission...there was fire in his eyes. I had the impression that he was coming straight from the fire. I asked Him, why do you want me to paint this? and He said to me. "Because it is time for the Eagles to rise up and go forth in power and strength, from the fire of refinement and testing, soaring into revelation...purified by My Love set on course by my Spirit...for Destiny!!!" I painted this in New Day Church at the Glory Breakthrough Prophetic Healing conference with Georgian Banov, Patricia King, and Todd White. When I got to the church, there was an eagle that their artist had made right in the center over the band. 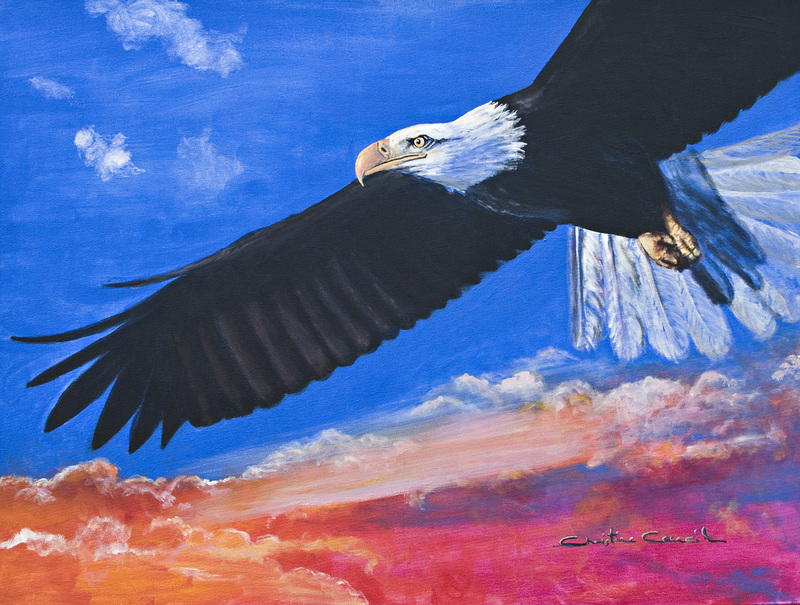 She shared her vision with me...and said it was a confirmation for her to see me painting an eagle.